As Christians we all have a common vocation to be holy and to share our faith (CCC 1533). Throughout childhood, parents are the primary teachers (i.e. CCC 1653) with the support of on-going structured programs to focus on faith development over time, but eventually the responsibility shifts to each of us. At different phases of our adult life, it is positive to evaluate where we are at in our faith life and consider what we are doing to nurture our own faith, as well as those around us. Being able to support others begins with ourselves and the foundation we have in our own faith. As a minimum starting point, the precepts of the Church (CCC 2041-2043) provide guidance on whether or not we are practicing Catholics, giving points of reflection. We can also think about how fully we are allowing the grace of the sacraments to affect our daily lives and think about how active and intentional our prayer life is. How devoted are we to reading Sacred Scripture? Furthermore, we can consider how we are engaging in opportunities to learn more about our faith from and alongside others. While Our Lady of the Valley offers structured group studies from time to time, there are also a range of resources available for free to parishioners, including a subscription to Formed.org, which is a key resource offering programs, movies, talks, and books. The programs are grouped into categories including: Exploring the Catholic Faith, Bible Studies, Sacramental Preparation, Discipleship Groups, and Special Topics. There are PDFs available for all of the leader and participant guides as well. Many of the movies focus on the lives of Saints. A sampling of the audio categories are: Prayer and Spirituality, Conversion Stories, Marriage and Family, Adult Faith Formation, and Apologetics. Below are two programs that are beneficial starting points. You are encouraged to view the Sacraments page and explore the Formed site to see additional topics and formats. The Symbolon series has 20 sessions in 2 parts. Part 1: Knowing the Faith is an excellent starting point, an opportunity to self-assess which aspects affirmed what you already knew, which were new, and which topics you would like to explore in more depth. The Sessions are: The Journey of Faith; Divine Revelation; The Bible; The Story of Salvation, Who is Jesus? ; The Paschal Mystery; The Holy Spirit and the Life of Grace; Why Do I Need the Church? ; Mary and the Saints; and The Last Things. Part 2 then expands on this foundation with a focus on application to our daily lives. Dr. Edward Sri facilitates each of the sections with a range of other leading Catholic voices. 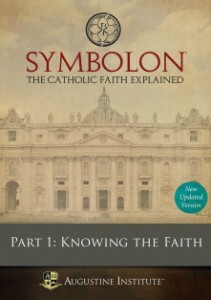 If you appreciate the format of Symbolon, there are many other resources from the Augustine Institute that are similar in structure with many of the same people. 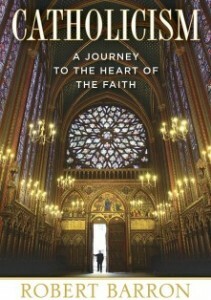 Bishop Robert Barron’s Catholicism: A Journey to the Heart of the Faith also provides a strong foundation. Recorded in 50 locations around the world, Bishop Barron provides a historical and cultural context for the Catholic Faith in 10 sessions. If Bishop Barron’s style is a good fit for your learning preferences, his website offers many free resources, including homilies, articles, and videos. He also has daily email programs during Advent and Lent. Concurrent with investing in our own faith development, we can influence the lives of those around us through the way we live our lives, a willingness to share our testimonies, and connecting others with resources. Think about the different layers of your circle of influence. How can you leverage social media to share resources? Are your daily routines conducive to nurturing the faith development of those around you? Does your outlook and approach to life inspire and encourage others? Do you positively influence the culture of a supportive church community that seeks to build on strengths and constructively address areas for improvement? How can your strengths complement those of others around you? If you have not intentionally thought about your role to be a disciple of Christ in order to support the mission of evangelization, talking about religion with others may feel intimidating. It is okay to start small and then challenge yourself to step out of your comfort zone and build confidence over time. In addition, remember the power of prayer to seek the guidance of the Holy Spirit, as well as to seek the will of God for your life.